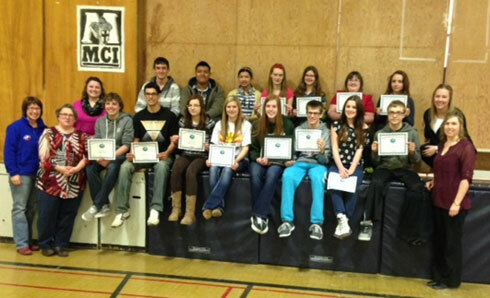 The 2014 Marquis Global Citizenship Award was presented to the Minnedosa Collegiate C.H.A.N.G.E. student group at a school assembly at the collegiate on March 25, 2014. The Citizens Helping All Nations Grow Equally group has been active for the last seven years volunteering for many local causes and raising over $75,000 for projects in the developing world. Marquis board member Kim Burgess and Education Program Facilitator Samantha Dellezay presented a group certificate to be displayed at the school, as well as individual certificates to group members. For more information on the work of the C.H.A.N.G.E. group, see the April 2014 Marquis Newsletter by visiting our Library page. You can also view the article that appeared in the Brandon Sun.